Rates are likely to hit 4.5 percent to 5 percent next year. This could put pressure on buyers to act; there are usually options open to buyers for working around higher rates, but buyers in high-priced markets will have more problems. It could also stymie the existing-home sale market as sellers decide to stay put instead of trade up at a higher mortgage rate. Throughout 2015 and 2016, buyers enjoyed historically low mortgage rates for many months — which finally began to increase in mid-November, despite predictions that they’d rise sooner. With such an unusual end to this year, what should real estate agents (and their clients) be expecting in 2017? Inman interviewed seven housing and economy experts to dig into their thoughts about mortgage rates next year; here’s what they told us. Will we see rates go back down? “The day has finally come that people have been talking about for two years,” said Steve Cook, editor of Real Estate Economy Watch, “when you start seeing a steady rise in interest rates. “The kind of rates we were getting earlier this year, down to 3.5 percent — those days are over,” he added. “I’m thoroughly confident that historic lows will not be reached again anytime soon,” confirmed Ralph McLaughlin, Trulia’s chief economist. “I don’t believe we’ll see any pullback until after the inauguration, but even the best-case scenario suggests that the historically low rates that have been in place for the last few years are firmly in the rear-view mirror, and that the trend will be toward increasing rates through 2017,” said Matthew Gardner, Windermere’s chief economist. How high could they get? The consensus was that the 30-year fixed rate in 2017 will likely stay in the 4-percent range — 4.5 percent to even 5 percent by year’s end. Mark Fleming, the chief economist at First American, said that his new estimate of next year’s rate movement “shows mortgage rates getting much closer to 5 percent at the end of next year. “Because of that, we estimate that that will reduce the amount of expected home sales by about 200,000 over the course of the entire year, which is roughly a 4 percent decline on our original expectation,” he added. “With rates floating around 4 percent or so, we could see an increase of 50 or so basis points in the next 12 months,” predicted Cook — about half a percentage point. “Our forecast is saying we expect mortgage rates to hit 4.5 percent next year,” said Jonathan Smoke, chief economist at realtor.com. “I think in December we’ll see the Fed raising rates and we’ll see more Fed hikes in 2017, and with that I wouldn’t be surprised if the 30-year fixed mortgage rate hits 4.75 percent,” said Svenja Gudell, Zillow’s chief economist. “My forecast is for the 30-year fixed rate to rise above 4.5 percent by year’s end, and worst-case scenario, knock on the door of 5 percent,” said Gardner. As rates start moving up, buyers might feel pressure to act — up to a point when their homeownership dream becomes out-of-reach. But we aren’t there yet. “We don’t think rising rates are going to have a very noticeable effect on the housing market, either in terms of new sales or homebuying activity,” said McLaughlin. “Mortgage rates would have to be 7, 8, 9 even 10 percent for the cost of buying to equate the cost of renting. “From a financial perspective, buying a home is still a good deal over a 5 to 7 year period,” he added. “Depending on how buyers see it, it’s going to act as an incentive to a lot of buyers to get out there before it gets even worse — but it’s also going to make it more expensive, and people who are continuing to rent and see what happens might not take the step to buying,” noted Cook. “Interest rates alone have been almost an unintentional subsidy for homebuyers that basically is going away,” he added. And the overall economy has a bigger effect on mortgage rates than creating pressure in one direction or another. “People have been wondering how the run-up in interest rates is going to affect homebuyers in general, much less first-time homebuyers, and in our view, that really depends on whether income growth picks up,” said Doug Duncan, senior vice president and chief economist at Fannie Mae. 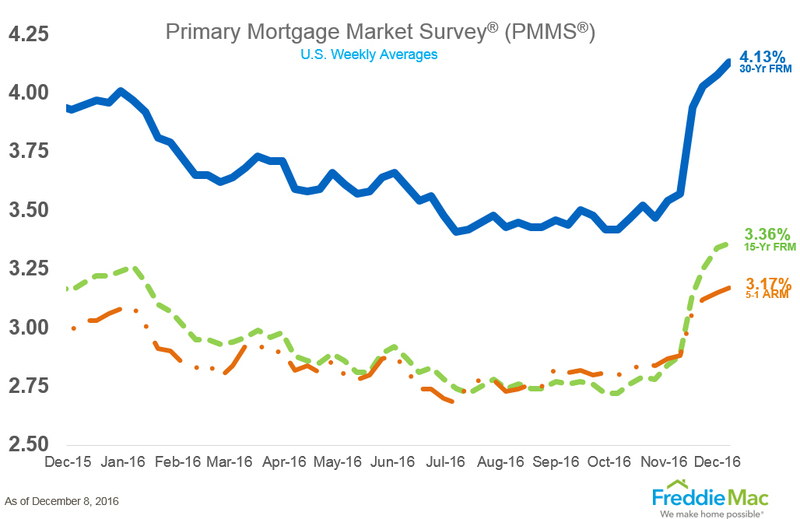 “If income growth picks up, then the rise in interest rates will affect refinancing, but not the home purchase activity,” he predicted. Fleming added that First American’s forecast for house price growth is now 3.5 percent instead of 4.8 percent. Buyers might be spoiled by the long stretch of low rates, noted Smoke. So if rates jump above 5 percent, it might be time for concern — but now, there are many things buyers can do to offset the higher rates, Smoke noted, including looking at homes in lower price ranges, putting more money down or changing term lengths on their mortgages. When sellers have bought a home at a low rate, and rates are rising, a phenomenon known as “rate lock” can take effect — sellers have a disincentive to move. “When rates move dramatically in a short period of time, it’s the existing-home market that slows down,” said Smoke. “We’ve had effectively a 30-year tailwind run of declining mortgage rates,” noted Fleming. “At this point in time, maybe they go up or down a little bit, but the long-term trend over the past 30 years has been lower and lower and lower mortgage rates,” Fleming noted. This becomes a problem when rates are rising upward from historic lows. Although most buyers probably won’t be overly affected by rising mortgage rates — which are still, relatively speaking, very low — the hotter markets in the country will definitely see a more immediate effect from rate bumps. “Even a relatively small change from 3.5 up to 4 — even that is already going to start influencing the more expensive markets,” posited Gudell. “So if you’re located in San Francisco, Los Angeles, Seattle, New York, Miami, that might very well have an impact on you because you’re already stretching your budget as it is to get into a home that you can barely afford at historically low mortgage rates. “In these places where affordability is already an issue, seeing these small bumps will already have a slight dampening effect, and we’ll see that affect not on all buyers but specifically first-time homebuyers or lower income folks. People who are repeat buyers or buying higher-end homes won’t feel it so much,” she added. “The Fed pushing short-term rates up doesn’t necessarily automatically translate to higher mortgage rates, but it does put upward pressure on them,” explained Fleming. At last year’s December meeting, the Federal Reserve raised short-term rates for the first time in years — and it’s meeting again next week, so it’s anyone’s guess what will happen to rates afterward. “If Trump goes ahead with his infrastructure plans, which is probably a smart thing to do and a no-brainer as far as Congress is concerned, it will stimulate the economy and probably increase pressure on rates,” said Cook. “We will likely still see volatility in mortgage rates over the next 2, 3, 4 months as Trump unveils cabinet members and specific policies he wants,” said McLaughlin.